The 15 Best Camping Spots in Texas! Camping: Explore something a bit more primitive by pitching a tent for the night. Set up a fire and tell ghost stories until you fall asleep. Maybe, renting out a cabin or a camper is more your speed, where you have the comfort of lights, a bathroom, and a bed. Whatever your preferences, camping adventures await you in Texas. Here are our 15 favorite spots. A beautiful backdrop of pine trees, the lake and tons of other extracurricular activities like good old fashioned fishing. Is there anything like a classic camping trip? One of the most beautiful sites in Texas is the Frio River. It is dotted with the best camping spots. Garner State Park luckily has places for you to do it! Come here for awesome hike and bike trails and spectacular view so the notable Texas hill country. Known as one of the most scenic parks in the entire state, Inks Lake State Park is great for camping. People love it here for the clear lake water, deer watching and fishing. One of the more underrated parks in Texas, Lake Bob Sandlin State Park is not usually packed during any season, making for a great trip to getaway for a serene environment and the be one with nature. Probably the state park that all the others are quite envious of is Palo Duro Canyon. The hues of red rock settled on top of another make for an amazing place for photos, but even better for rock climbing and other outdoor adventures. If you’re a can of Palo Duro Canyon or canyon landscapes in general, Guadalupe Mountains National Park is a beautiful park to go camping, with mountains holding the record for the highest peaks in Texas. Enjoy beautiful views of the Chihuahuan Desert landscape. It’s the biggest park in Texas and trust us when we say, you want to visit here. Close to the U.S.-Mexico border, this place is filled with steep canyons, infinite hike and bike trails, unbound horizon of sunny skies and intense opportunity for star gazing at night. If you’re into marshy landscapes, Sea Rim State Park is the place for you. Also the spot to be if you enjoy watching waterfowl and shorebirds in their natural state. There’s cabins for rent here, or you can rent out your own spot with your mobile camper. This is where all of life’s simplicities shine. Go swimming, fishing and really enjoy that beautiful clear blue water from the Brazos. This park is known for its beautiful cascading waterfalls. Texan waterfalls, but still waterfalls! There’s tons of great things to do like hike, bike and simply enjoy the cool waters slip through your fingers while basking in the sun. For the locals of Austin, Texas, this is a wonderful haven that’s right next door. People tend to hang out right under the falls. Get away from the city noise and really enjoy fantastic flora and fauna. This is a lovely reservoir that is known for fishing the bass, catfish, and striper fish. Other than fishing, visitors enjoy mountain biking, picnicking, and boating. Enchanted Rock is often visited by day visitors looking to get photo ops of the iconic boulder at the top of the peak. You can also camp out here. Just think of those incredible night skies awaiting you. What a fun option for children that also love camping. The riverbed is where you’ll find the dinosaur tracks but you’re also welcome to go hiking and biking as well. This is the best place for people to get up close and personal photos of wild white tailed deer. Take the opportunity to also relax hike, and bike! These are some of our favorites, but we all know that Texas has all kinds of opportunity for camping. 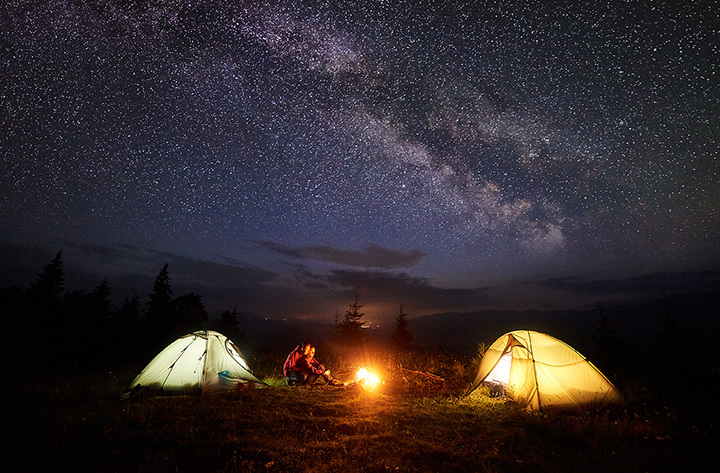 If we missed your favorite, please let us know your favorite things about your camping trips!